This year we will be celebrating the business + community in a fun an exciting way! Our local business and community leaders come together for a night of honor, respect, reflection, and contribution. This event is not only a way to partner with our community but is also the largest fundraising event of the year. Without our goals being met we will have to cut the types of programming we can offer and nobody wants to do that. With a goal of raising funds to support the program of work that the Chamber does through our three core initiatives of innovative training, collaborative partnerships, and advocacy. The Cedar Hill Chamber of Commerce works hard to give back to the community it serves. This nonprofit organization is made up of members from our community, tasked to serve our community, and can only succeed with the support of our community. As we look back at 2018 to see how much we have done together we encourage you to participate in this fundraiser so that we can look forward to the opportunities that lie ahead. 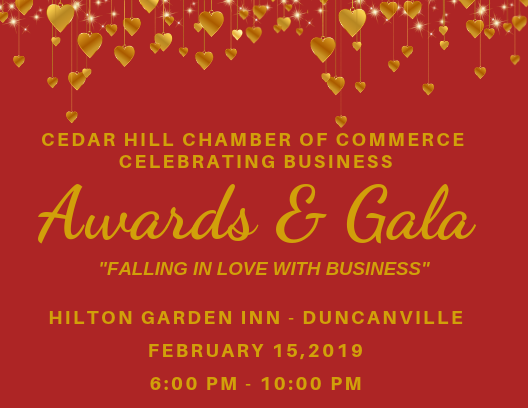 As we look forward to all that 2019 has to offer we ask that you spend the evening of February 15th from 6:00 PM- 10:00 PM with us "falling in love with business". We want to say thank you to our Gala Committee chairs, Ashley Forsythe (Chick-Fil-A), Latasha Cummings (Tea N Tee Event Rentals), our 2018 Chair Aranda Bell (Zula B. Wylie Public Library), and our 2019 Chair Steve Hendon (Practice To Business). Without their support and dedication, this event could not happen. We want to thank our 57 new members who joined in 2018 for their continued support. As well as our 318 total members who support this organization every year through dues, donations, dedication, and determination. Please don't hesitate to call with any questions you may have! We Are a success because of YOU! !